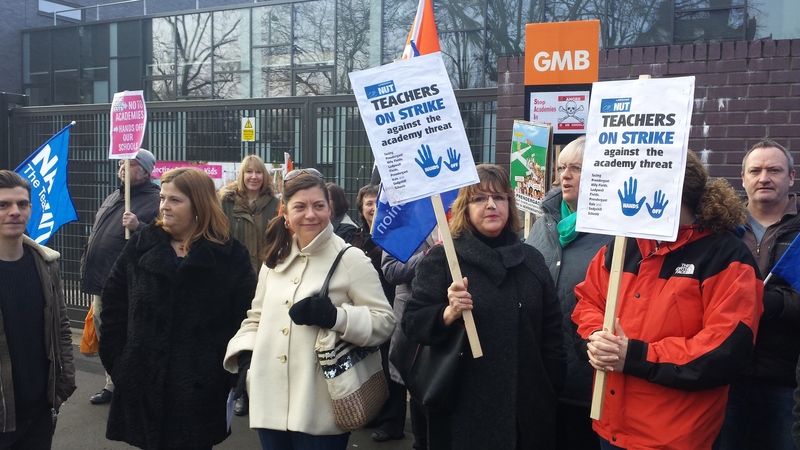 This article looks at the recent developments following the election, Nicky Morgan’s announcement of a new Education Bill and the recent victory in Lewisham against at a MAT (multi-academy trust) conversion. Martin Powell Davies from SAIL (Stop Academies in Lewisham Campaign) explains in detail behind the victory. National Secretary of AAA, Alasdair Smith, outlines the context, analyses Tory policy and discusses the implications of the Lewisham victory. The unexpected election result has generated a whiff of Tory triumphalism. 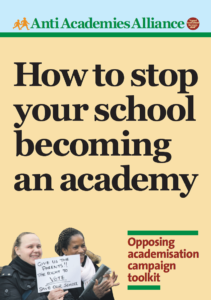 They believe they have a mandate on social policy and, although it was not mentioned in their manifesto, they plan a radical extension of the academies programme to include ‘coasting’ schools. Yet there is no evidence that their education policies are popular. Ironically, Lynton Crosby (Cameron’s spin doctor) argued a year before the election that Gove had to be sacked to detoxify the Tories. But now the Tories believe they have the wind in the sails. Morgan’s announcement of a new Education Bill is pure Gove: More “failure”, more blame, more academies, and more privatisation. This government only has one education policy – privatise everything. They seem oblivious to the fact that academy conversion doesn’t guarantee school improvement, social justice or more autonomy. “If you are going to tell a lie, tell a big one and tell it often”. First it is not a landmark bill. It’s a continuity bill following directly in the footsteps of the 2010 Act that created the framework for accelerating academies conversion by removing any shred of democratic decision-making and turning consultation into farce (The 2010 Act allows consultation to happen after the decision to convert had already been made). The hollow rhetoric about ‘spotting failure on the first day’ and ‘allowing the best education experts to fix it’ is obscene. The implication is that heads, governors, teachers and parents are either too stupid or malicious to see problems in their own school. If Morgan had any understanding of what it means to run, or even work in a school, she would not make such a statement. This use of ‘failure’ to pursue ideological convictions is very damaging to school communities. It masks the real problems and encourages fake or dishonest solutions. Finally, Morgan’s claim that campaigners have exploited legal loopholes for ideological reasons is a classic inversion of reality. There are almost no bureaucratic hurdles or loopholes to conversion. Trust me, if there were, the AAA would have used them. There have been hardly any successful judicial reviews and where successful they have only stalled the process temporarily, usually because the consultation arrangements were not followed properly. Academy conversion requires a simple majority decision of the governing in one meeting only. It can take place in a matter of 6 to 8 weeks. Perhaps the only exception to this has been events in Lewisham (see below) but this came as a surprise to us and is apparently the result of a drafting mistake in the 2010 Act. All this fakery about bureaucratic and legal loopholes is a smokescreen to hide the widespread concerns by parents and teachers about the lack of democracy and honesty in academy conversion. Over the last 8 years we have supported hundreds of groups asking for help against conversion. They approach us. They are not motivated by ideology. In fact their usual complaint is that ideology (“academy conversion is good”) is being forced on them. There is a barely a week that goes by without another request for help, another complaint another group of parents frustrated that their views are not listened to. Just this week, we have been contacted by a group of Somali parents in West London concerned about the lack of consultation in an Ark primary school. A teacher and governor in Medway in Kent contacted us about a scandalous cover-up of child abuse in an academy. A parent has written to us complaining of bullying by an academy head in Wolverhampton. People are contacting us because the normal avenues for complaints have been closed. Accountability is dying. It is being replaced by corporate dictat. So while the ‘sweeping away of resistance’ may make for good headlines in the Tory press, the reality is very different. Injustice creates resistance. If there are no checks on a system, abuse will increase. This is exactly what is happening. Schools are now the victims of financial scandals, cronyism and outright corruption. They have also seen the growth of ‘fat-catism’ – as a minority of heads or CEO’s have chosen to pay themselves huge salaries (£365,000 is the highest we know of). For years the proponents of academy movement claimed that local authority schools were straight-jacketed by a ‘one size fits all’ approach. Academies would bring diversity and innovation they said. So it seems a little ironic that that Nicky Morgan now believes that one corporate school improvement policy fits all circumstances. Schools in the newly invented category ‘coasting’ schools apparently require exactly the same treatment as schools in ‘Special Measures’. Whatever the problem, the only solution is academisation. Yet parents, teachers and head teachers know that academisation is not a magic bullet for school improvement. Morgan says that academy status will prevent children languishing in under-performing schools but 46% of sponsored academies are themselves judged by Ofsted as ‘requires improvement’ or ‘inadequate’, including a number in MAT chains. What’s going to happen to failing academies, Nicky? The Secretary of State has some important questions to answer. But perhaps the central question is what happens to failing academies? Are they taken over by other academies? Why can’t successful local authorities step in and support these schools? What happens if an academy wants to go back to the local authority? What happens if parents aren’t satisfied with their academy? And so on. These questions have been asked but the only answer that I am aware of is that other academies will take them over. In the long run this means the takeover of schools as big chains swallow up small chains and single schools. Michael Gove called it a ‘supply side revolution’. It is a nightmare scenario that has already been tested on public transport and increasingly in health. It leads to a concentration and centralisation of power in the hands of the few. The consumer – the parents and children –will be dominated by corporate power. No wonder, they talk about the need to sweep away resistance. This Tory attempt to silence dissent and deny a democratic voice for parents and staff will backfire. In effect they are saying ‘we don’t care what you think, we know best. Forget evidence, our ideas are more important. Business is best and anyone who disagrees can get lost’. Such hubris breeds resentment and can create deep divisions. It creates a ‘them and us’ culture. If school communities degenerate into head teacher and governors v parents and staff, our children will be the losers. The social fabric of our school system –already fraying at the edges – will unravel further. Yet there are good grounds for optimism. 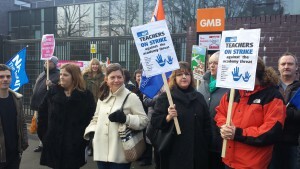 Teachers and their unions are still fighting conversions, and in some cases resorting to strike action. Parents are demanding ballots on conversion and at Hove Park last year a particular controversial conversion was halted by united, parent & teacher action. Although the Lewisham technicality may soon be closed, we should use the law as it now stands to halt any current proposals for MATs. We also need to target this new Education Bill – inside and outside parliament. And we’ll need to find new ways for parents and others to get justice within a privatised education system. But there’s something else to watch. Schools will feel the full brunt of austerity measures in the coming months and years. Not only will the quality of our education system be threatened, the full force of privatisation – for profit schooling – maybe unleashed. For the proponents of GERM – the Global Educational Reform Movement – austerity provides the perfect opportunity for privatisation and an education world dominated by corporations such a Pearson and Murdoch’s NewsCorp. This is the real Tory education vision. Anti-academy campaigners from SAIL, the Stop Academies in Lewisham Campaign, are celebrating after the Chair of Governors of the Prendergast Federation announced to parents today that they are stopping the ongoing consultation on their plans to convert their three federated schools into a Multi Academy Trust. Instead of being able to go ahead with a vote for academy conversion at the upcoming Governing Body meeting on June 17, they have had to defer their conversion plans in the face of a legal challenge made by a parent. The challenge was based on Regulation 46 of the School Governance (Federations) (England) Regulations 2012. SAIL campaigners spotted that this Regulation stated that, at least when an Academy Order is being applied for “in respect of a federated school” (like the three schools in the current Prendergast Federation of three maintained schools”), the application must be made by specific categories of Governor. These include “the head teacher of the federated school”, “any parent governor or parent governors elected by parents of registered pupils at the federated school” and “any staff governor employed by the federated governing body or local authority to work at the federated school”. When the Prendergast Governors met to vote for an Academy Order in February 2015, one parent governor was absent and the elected staff governor voted against the application. Clearly, the Regulations had not been followed and the Governors have therefore had little choice but to retreat. While these Regulations remain in force, then other campaigners may want to make a similar challenge. Labour MP Kevin Brennan has also tabled a series of parliamentary questions asking how many other Academy Orders made on behalf of a federated school since September 2012 and whether they have complied with Regulation 46. Of course, this is only a temporary victory as it’s clear that the DfE now intends to rewrite its own rules to prevent such a challenge being made in future. 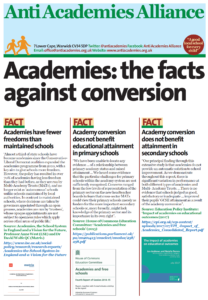 Sheila Longstaff, DfE ‘Project Lead, Academies South Division’ has written complaining that “it is disappointing that this issue has delayed the academy conversion of a school when the majority of the governing body voted in favour of the applications”. That sentence gives the game away as to how little the DfE care for genuine consultation – as they clearly expected the outcome to be conversion whatever was said by parents, staff and the local community in response to the academy proposals. At least the current Regulations – introduced under the last Conservative Government after all – make sure that Governors can’t just force through academisation of a federated school but have to win the backing of a range of stakeholders. Even the Thatcher and Major Governments legislated for parental ballots before a school could take on grant-maintained status. For this Government, however, it seems that winning the support of the school community is just an awkward hindrance to their ideological mission to rip apart democratically accountable local authority schooling. Pro-academy Governors may be angered by the legal challenge but parents, students and staff are delighted. That’s because this challenge was just one part of a deep-rooted community opposition to the academy plans that included meetings, strikes and local demonstrations. 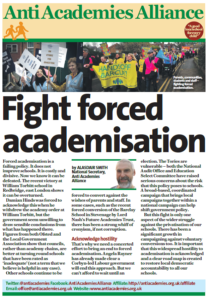 Governors had failed to convince the school community that academisation was in the interest of education – and how could they when the educational evidence simply isn’t there to support academies? This entry was posted in News, Top story and tagged Forced academisation, Nicky Morgan, privatisation. Bookmark the permalink.